Here's a quick and easy weeknight pasta that's a break from the usual. 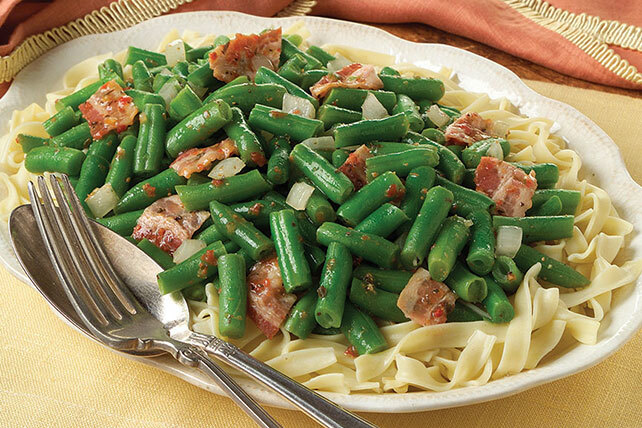 Get out the egg noodles, green beans and bacon, and let's get started! Cook and stir onions in dressing in large skillet on medium-high heat 5 min. or until onions are crisp-tender. Add beans and bacon; stir gently. Cook 8 to 10 min. or until heated through, stirring occasionally. Meanwhile, cook noodles as directed on package, omitting salt. Drain noodles. Serve topped with bean mixture. When fresh green beans are in season, use them instead of the frozen green beans. Trim cleaned beans and cut diagonally into thirds. Add with bacon; continue as directed. Serve over hot cooked linguine, fettuccine, or long-grain white or brown rice instead of noodles.